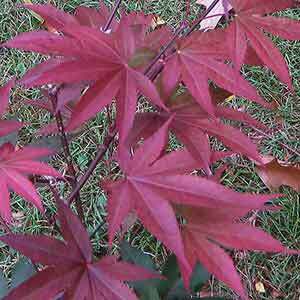 If you are looking for the best purple foliaged Japanese maple, then Acer palmatum Emperor 1′ could be the one. The foliage is a deep red to purple, and it holds well into autumn. It is faster growing than its main rival ‘Bloodgood’. In general terms, it will put out new foliage 2 – 3 weeks later, which makes it great for areas that are frost prone as the later leafing out is often after frosts and therefore lessens the impact. Emperor 1′ also holds the foliage for about 2 – 3 weeks longer than some others and this makes for for added interest in the season. It is a maple that adds some great contrast against the ever-present greens, and the red is a little stronger than most others. It seems to cope well with hot summers, as long as moisture if kept up to it. A good deep watering every few weeks during hot dry summers will keep it in good condition until it is well established. It will reach 5 metre with a crown spread of 5 metre, so give it room in the landscape to grow to its full natural potential. Try to use this as an accent plant in areas of green foliage for impact in the landscape. Also well suited for use as a specimen tree in may garden designs. As this is a smaller growing tree it is suited for use in courtyards and smaller gardens. Foliage – Red from spring through to autumn, changing slightly according to temperatures and through the season.